Choosing the right pillow top mattress can take some time, because there are lots of different options to choose from. It’s best if you can try them out yourself to find out what it feels like to you, since mattress preferences are very personal. Additionally, you should consider these 5 key points when making your selection. If you need extra support for your back, then you may prefer a firm mattress. If you enjoy sinking in to your bed, then a soft mattress is the better choice for you. 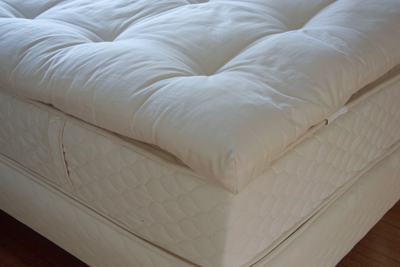 It’s easier to achieve softness with a mattress topper, and materials like wool or cotton are naturally soft, too. Certain mattress pads retain more body heat than others. For example, a thick, dense memory foam mattress will feel hotter than one made of wool. In fact, a natural mattress made of wool is great all year round, because it provides extra warmth in the winter, but reduces heat in the summer. Of course, the sheets you use also contribute to keeping you warm or cool at night. A latex mattress isn’t the right choice if you or your partner are allergic to latex. A wool mattress is a great choice for allergy sufferers, because it’s not made with synthetic materials. Bed bugs and mites also stay away from wool mattresses, and that’s one less thing to worry about. A good mattress should last for many years, but it depends what your mattress is made of. For example, cotton, polyester, and egg crate foam are less durable than wool, memory foam, or latex. If you plan on moving within the next few years, you may also think about how easy it is to move your mattress. A memory foam mattress is very heavy and difficult to move. People spend about a third of their lives sleeping, which makes choosing the right mattress very important. Unfortunately, many mattresses are made with toxic ingredients and release harmful fumes throughout the night. To ensure that you stay healthy, it’s best to choose an organic mattress with natural ingredients over synthetic ones.